← That Funny 24 Hours. 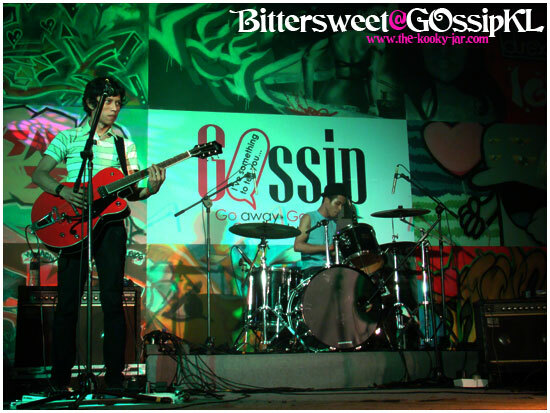 That night – 26th of September – GOssip KL rocked Asia Cafe, Subang Jaya. Pumped with adreneline (and nervousness, coffee, and all kinds of legal stuff), we were running around like Energizer bunnies. I was part of the Stage Managing side, so I didn’t really get to snap much photos except towards the end. But here are what I have, and I’ll let them photos do the talking. 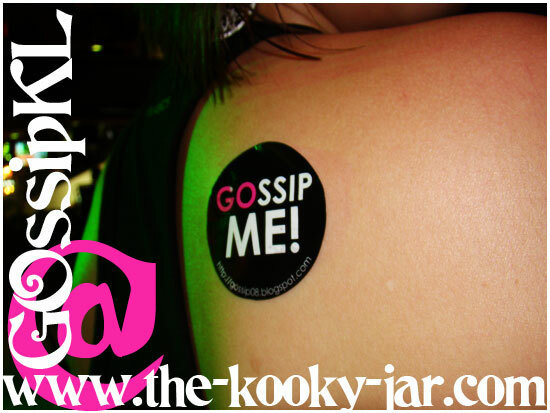 Everyone was ‘pimped’ with cool GOssip stickers. Juwita Suwito, is one really nice person. And she sounded just as good, if not better, live. 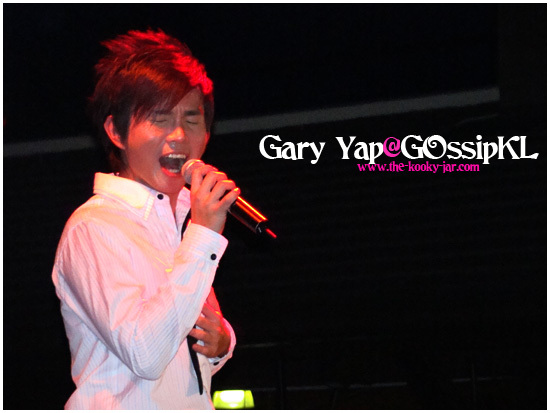 He was an 8TV Host for one of the Chinese segments, and he sang quite well that night too. 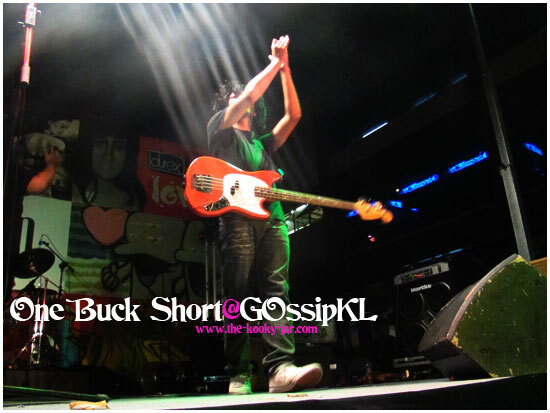 A lot of female fans went gaga when he was performing. OMG. OBS. Oh My Gawd. One Buck Short. Bittersweet were the ending performance. Let me introduce to you Denise Chan. 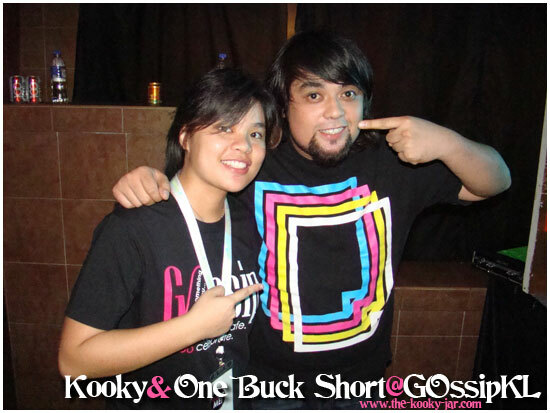 She’s 16, and she emceed with Pietro from Hitz.fm. If I could sum her up with three words, they would be: brave, mature, awesome. And someday, the world is going to know her. Beneath that pretty face is a fighter on her path to victory. Keep it up, Denise. 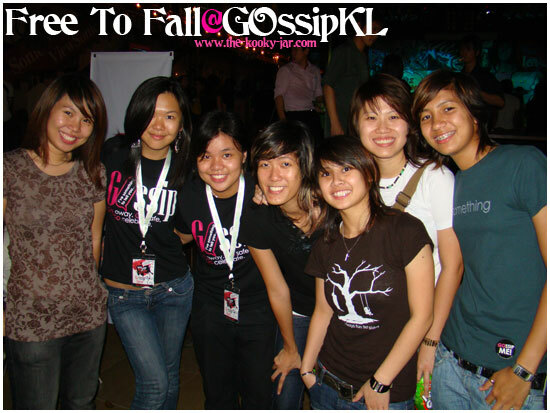 Free to Fall is a Christian rock band from Klang. I’ve heard of their stuff online, but they really rocked the house with their opening act for the night. After the street party I couldn’t help but search for them high and low just to get a photo with them. Star struck? Maybe. Impressed? DEFINITELY. And they’re unbelievably good-looking too. 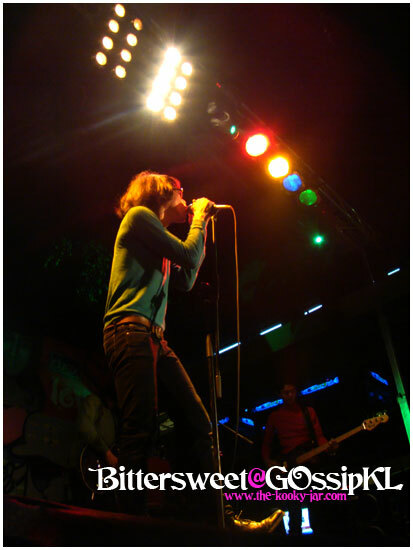 I actually think that the drummer (the one in brown shirt) was really hot cute with her energy and fiest on stage. Other artists including Suki, finalists from So You Think You Can Dance, Ayu, Army of Three, and a lot more (about 20 of them) were there that night, and it was just amazing. 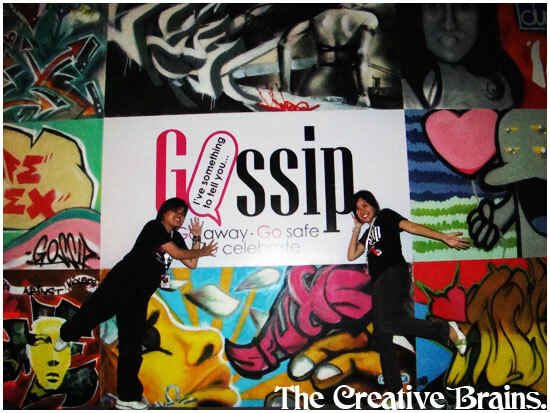 The entire event was just like the backdrop, a complete picture pieced together by 9 different graffiti pieces. That’s right. 9 different pieces put together. An idea by us (Ning Li, by the way, is my creative partner-in-crime and Kooky Partner), and we couldn’t help but emo a bit when the whole thing ended. It has been great pleasure just cracking brains with her, and am really looking forward to our future projects. 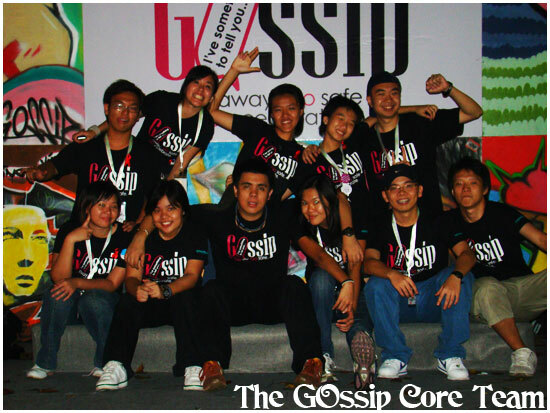 And last but not least, the core team that has worked friggin’ hard to bring this event alive. We’ll see you in Penang, this December. Yep, it was indeed madness…I’m amazed on how you guys worked so hard to make things possible. 😀 A job well done, while there are minor glitches along the way, you guys really nailed it by the end of the day. I will be looking forward to your future events with great interest. It’s a pleasure to meet you in person that day, Vern…. 😀 Do keep in touch. Cleffairy, or should I call you Elizabeth? 😉 Thanks for being a part of this event and for promoting it on your blog. 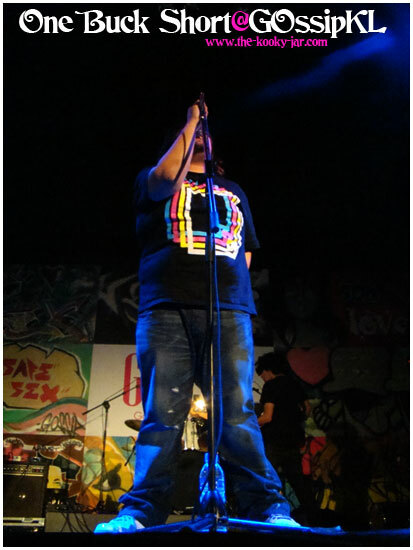 Maybe we’ll see you in Penang this December? Haha! If not, rest assured there are plenty more projects to come. My mind’s running about already! babe good job on the event! it looked really awesome and and i’m so sorry again that i couldn’t be there. a friend of mine was wondering why i was so hard up on coming for the event and i told them ‘it’s cause Vern’s organizing it, and whatever vern touches is destined for greatness’. Pingback: The Kooky Jar » Blog Archive » O Ye, of Little Faith.